DESCRIPTION A spacious four bedroom detached family home having reconstituted stone elevations under a tiled roof with well planned accommodation presented in clean and tidy order but with scope for some updating. Benefiting from oil central heating and solar panels the well planned accommodation includes an entrance hall with stairs to the first floor, cloakroom, a through lounge, separate dining room, fitted kitchen leading to a good size utility room and upstairs there are four double bedrooms, one with en suite and a family bathroom. The property occupies a reasonable size plot with good frontage an adjoining double garage and a privately enclosed rear garden. 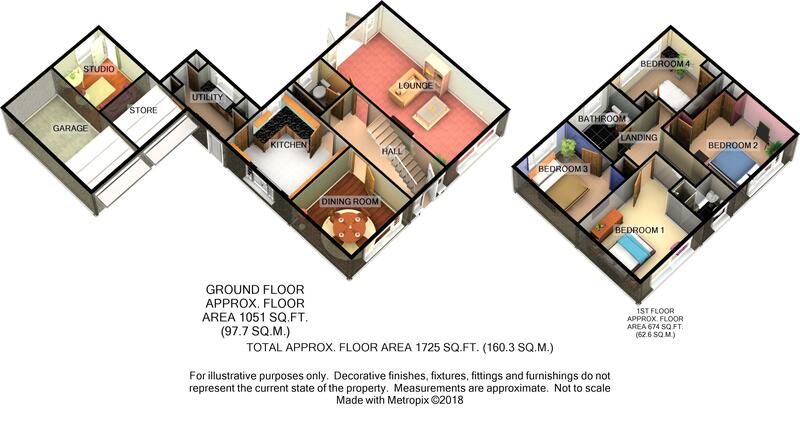 A good family home in a quiet select location and an internal viewing is highly recommended. SITUATION The property occupies a choice position in a quiet lane of this much sought after south Somerset village which offers good local amenities yet offering the convenience of being well placed for access to nearby towns of Sherborne and Yeovil and within a mile or so of access to the A303. CLOAKROOM having a close coupled WC, pedestal wash basin, fitted unit, vinyl flooring, radiator, coved and artex ceiling and secondary glazed window. LOUNGE 22’10” (6.9m) x 11’10” (3.61m) having a coal effect gas fire set into a reproduction fire surround, wall lights, double radiator, coved and artex ceiling, secondary glazed window to the front aspect and French doors to the rear garden. DINING ROOM 11’2” (3.4m) x 10’11” (3.33m) with radiator, coved and artex ceiling and secondary glazed window to the front aspect. UTILITY ROOM 12’ (3.67m) x 7’6” (2.29m) having a stainless steel single drainer sink, work surfaces with part tiled surround, range of Oak fronted units, two built-in cupboards, boiler cupboard housing the oil fired boiler, double glazed back door, door to the driveway and door to a large storage cupboard formed from the front half of one of the garages. EN SUITE SHOWER having a tiled shower cubicle with Mira shower unit, built-in WC and basin, shaver point, radiator, vinyl flooring and secondary glazed window to the front. BEDROOM TWO 13’1” (3.99m) x 11’10” (3.6m) with radiator, power points, coved and artex ceiling, secondary glazed window to the front and a range of fitted wardrobes. BEDROOM THREE 11’8” (3.56m) x 9’11” (3.02m) with radiator, power points, coved and artex ceiling and secondary glazed window to the rear. BEDROOM FOUR 11’10” (3.6m) x 9’7” (2.91m) with fitted wardrobe, radiator, coved and artex ceiling and secondary glazed window to the rear. BATHROOM having a white suite comprising a panel bath with tiled surround, pedestal wash basin with close coupled WC, shaver point, radiator and secondary glazed window to the rear. OUTSIDE The property occupies a reasonable size plot in a secluded position in a sought after part of the village. 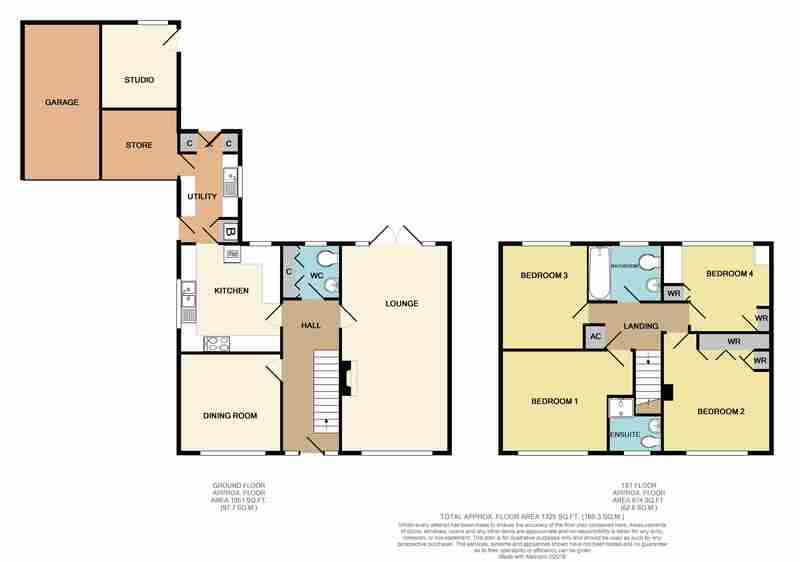 Approached through double gates over a tarmac drive and turning area leading to the TWO GARAGES one which is sub divided to provide a USEFUL STORE 8’6” (2.59m) x 7’10” (2.39m) with access into the utility room and at the rear accessed from the garden a useful OFFICE AREA 9’3” (2.82m) x 8’6” (2.59m). GARAGE TWO with automatic up and over door 17’3” (5.26m) x 8’6” (2.59m). The well established gardens provide excellent privacy and seclusion and at the front includes a lawn with flower beds and mature shrubs and trees. The privately enclosed rear garden includes wide paved areas, lawn, ornamental pond, mature shrubs and spruce tree (not protected). SERVICES Mains electricity, water and drainage are connected. Oil central heating. OUTGOINGS The property is in Band F for Council Tax purposes with the annual amount for 2018/2019 being £2,428.03. 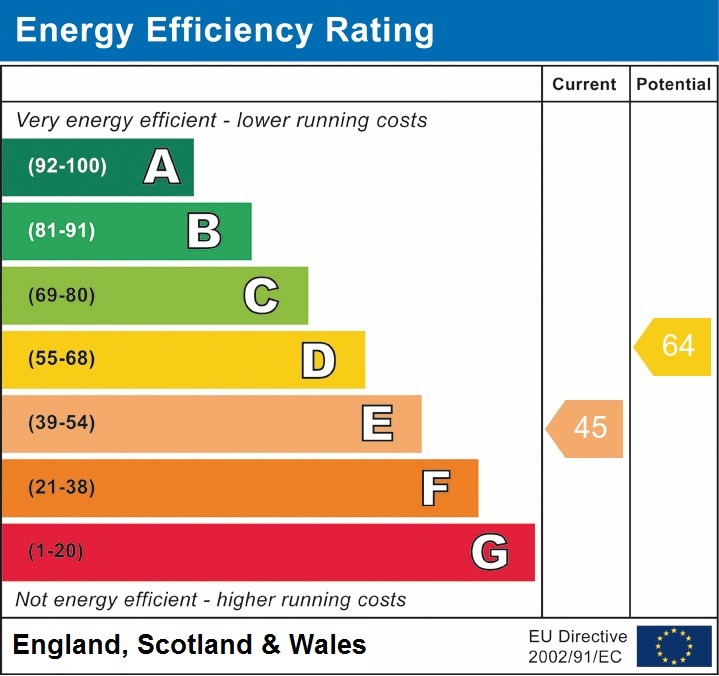 Energy Efficiency Rating E.